Here are pictures of our now Red kitchen. I absolutely love it and am so excited to finally have some color on the walls. Don't mind my magnet filled frig. So lately Cameron has been talking about the earth and how we live on Earth and that Jesus Christ and Heavenly Father created it for us. He also has been talking about becoming an astronaunt and going into space. So the other day we were driving in the car and he was asking me all sorts of questions about Earth. Then he said, " Mom, I am done with the Earth. I want to get in a rocket and go to space." I just had to laugh. Crazy boy. He is all about rockets and practices take offs and all sorts of things. I just love his imagination, so funny!!! We had an enjoyable Saturday with not much going on. I decided to take some pictures of the boys. They are getting so big. Cameron has not been feeling very good for the past couple of days. I finally got worried and wanted to know what was wrong so I took him in to the doctor, even though we do not have insurance until May 1st. I was relieved but sad to find out that he has tonsillitis. 10 days of antibiotics ahead of us but he should be okay. I hope it will go away with the antibiotics. I really don't want him to have to have surgery to get them removed this young. Luke and I are both sick with colds as well. Hopefully this will pass us soon. Hope everyone else is happy and healthy. Here are the pictures from our wonderful weekend of painting. We finished the boys room, the baby's room, our upstairs hallway, the stair walls, our really tall front entry, and the island in my kitchen. It was a lot of work but turned out even better than we thought. I am really happy with the outcome and can't wait to finish our family room. I also can't wait to get the rooms completely decorated and set up. I have so many ideas for the baby's and boys room, I hope they come together the way I want them to. Don't mind the mess, this room is the extra/junk room for now until the baby comes. Here they are for those who have been asking. I am 26 weeks now and am definitely showing it. I am feeling great and feeling the baby kick all the time, he is quite the active one especially at night. I just love being able to feel the baby move and to get to experience the whole thing, even if it keeps me up a little longer. Reid can feel the baby now and I think Cameron felt him the other morning. My only complaints are the constant heart burn, not being able to get comfortable at night, and having no clothes to wear. I am happy to say that I have not even had to wear maternity clothes yet. I am still in that stage where maternity clothes are too big but my other clothes are barely making it. I have luckily had some clothes that are a little bigger that have been working great. I am sure it won't last much longer though, I feel bigger and bigger everyday. I am looking forward to finally meeting this sweet little guy!!! Yesterday we had our ward egg hunt. I really wouldn't consider it a hunt because all the eggs were just sitting on a field but the boys had a blast. Luke just kept on going after the eggs. We also had another egg hunt with some friends of ours. We had the egg hunt at one of our parks that had a nature walk it was really pretty and you could really hide the eggs. All us moms went early and put the eggs out while the dads brought the kids over. We then had a BBQ and visited. It was so great to get together. We have the best friends ever!!!! Thanks for a great night! Reid had friday off and I have been wanting to paint our boys room and our whole house because the walls are all flat paint and as you can imagine have taken a beating with two little boys running around. We finally decided on what we wanted to do and what colors. Friday we got the boys room and the baby's room all done. Saturday we spent all day except for a couple of hours for egg hunts and a BBQ, painting our house. We stayed up until 1 am finishing off our last gallon of paint we had bought. Unfortunately we are not completely done and have to buy some more paint but the house looks so good and a ton better than it did. I will post pictures soon, I'll take them tomorrow when the sun is shining so you can see. I am so happy to have it almost done. On Wednesday Cameron, Luke and I and our friends Megan and Alex went to the Fort Worth Zoo. The boys have been bugging me for a long time to go to the zoo and we finally had a beautiful day and the opportunity to go. They loved seeing all the animals. The zoo was really beautiful and it was fun to see all the different animals. Camerons favorite were the Penguins, he loved watching them swim in the water. 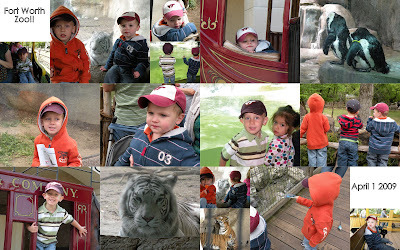 Luke loved all the animals and especially the train ride that we got to go on at the end. They also had this bird exihbit, where the birds were everywhere. You can buy sticks with food on them and the birds will land on the stick and eat the food. The boys thought is was so cool to have the birds so close. Luke kept on running after them trying to get them to eat off his stick. I was really excited to take them but I don't think I will do it again until this next baby is already here, there were lots of hills and it was really hard being pregnant, carrying a packback and pulling two boys in the wagon but well worth it to see how excited the boys were. We had a great day!!! !